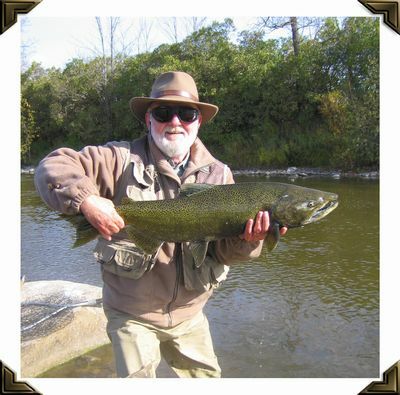 October and November are the months of the year to be fishing for spawning King Salmon on one of the many eastern Wisconsin streams that flow into Lake Michigan. 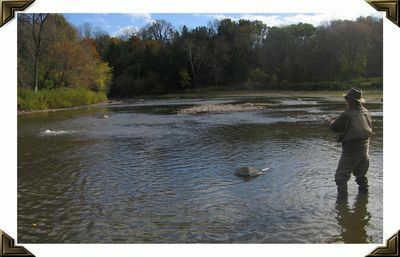 These photos were taken on one of those streams, the Manitowoc River, in late October. 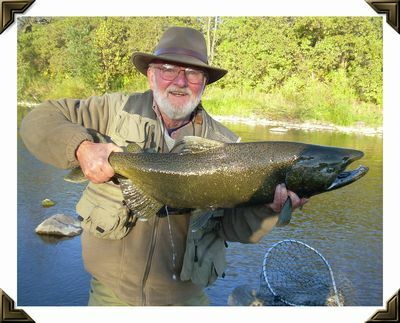 There weren't a lot of salmon in the river but there were enough to keep us interested. 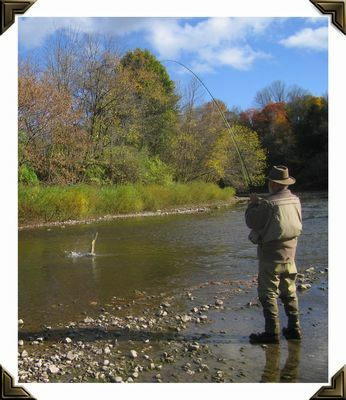 Make sure that you have ample backing on your fly reel. You may need it. A nice King. Click to enlarge the photo. Notice the milt dropping as I'm holding him. Those big fish like to jump as well as run. A pretty hen. Click to enlarge the photo. Notice the eggs dropping as I'm holding her. 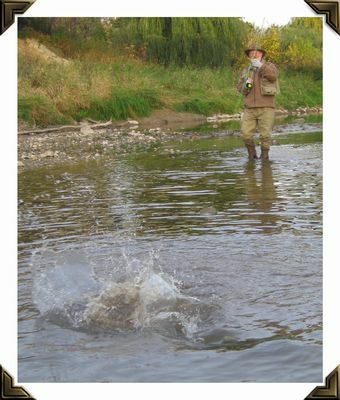 It's hard to get a photo of a salmon out of the water but this photo was close. 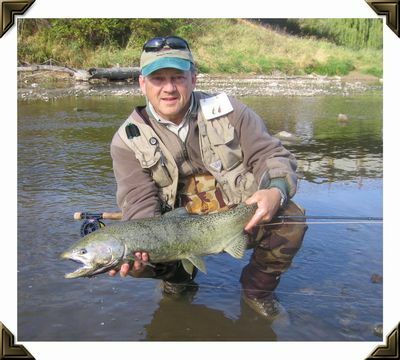 Mike Jacobs with a big Chinook (King) Salmon. Mike is our guide on all of our trips. 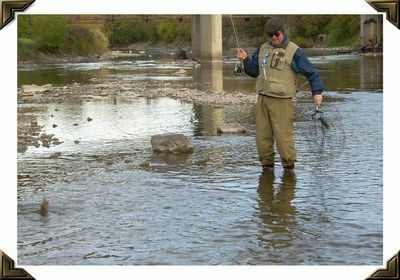 I have fished with several professional guides over the years and not one of them can hold a candle to him. Doug Nauman into a nice fish. 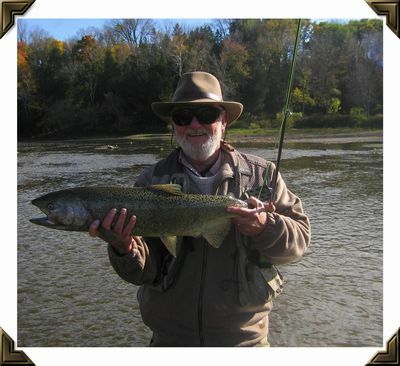 Doug and I are a couple of lucky guys to have Mike Jacobs as our friend and fishing partner. 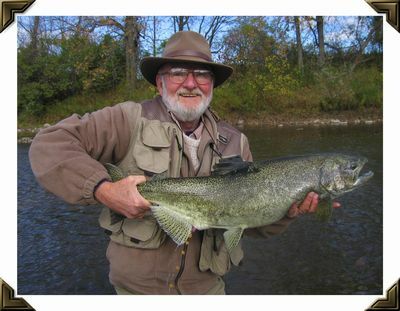 Mike Jacobs with another nice King. 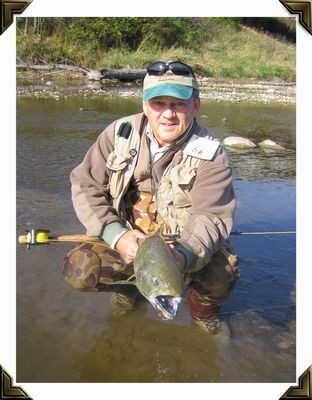 King (Chinook) Salmon fishing is a great experience. You should try it.